In a free standing electric mixer, mix the eggs with the sugar till pale in colour, almost white. Still mixing, on a lower speed add the butter, bit by bit. When everything is smooth and well mixed together, gradually add the flour with a pinch of salt. If you feel that the dough is too 'dry', add a little bit of cream (you may not need all of it, or nothing at all). Cover the ready dough into a cling film and put into the fridge for minimum 1 hour. Take the dough out of the fridge (work here with small pieces of dough, keeping the rest in the fridge) and roll to about 0,5 cm thick. Working quite quickly (so the dough doesn't get warm again, as it will be hard to work with it) cut out the stars or any other shapes you like. 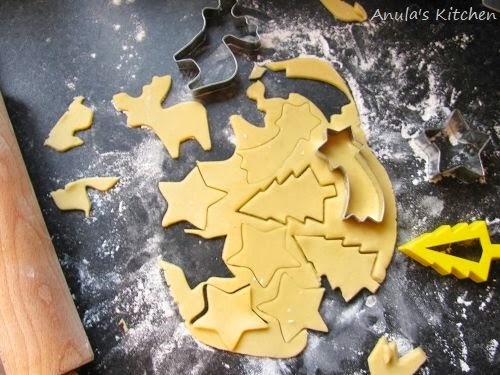 Glaze cut cookies with egg wash and sprinkle with some sugar to get a nice 'frosty' finish, or sprinkle with sprinkles (imitating baubles on the Christmas tree) or leave the cookies plain and decorate after the baking. Bake in the preheated to 180 C oven, till golden brown (it's hard for me to give you exact time, as I always work here by the look of the cookies and also ovens vary between them a lot, but you'll probably need minimum 5-7 minutes). Leave the cookies on a wire rack to cool completely and hardening before handling/decorating/eating!